OXFORD, Miss. 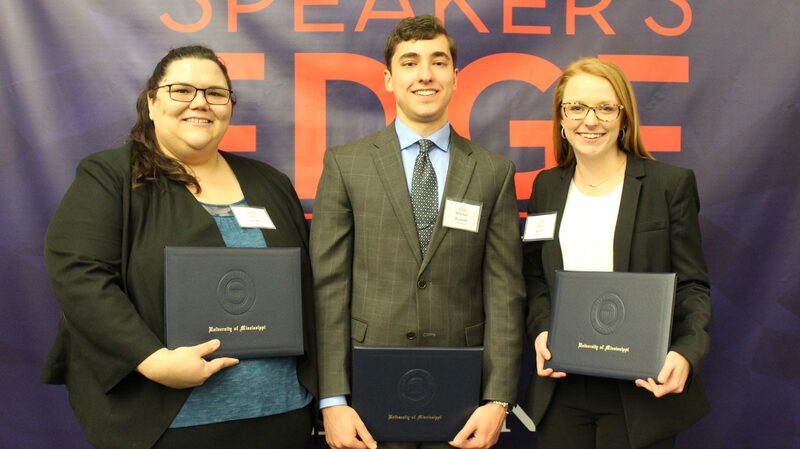 – More than 100 business and accountancy students tackled ethical issues ranging from gender discrimination to embezzlement and pitched ideas for boosting the workplace at the University of Mississippi’s annual Speaker’s Edge competition. 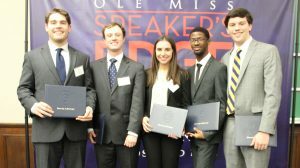 They were joined by 69 judges and 17 coaches for this year’s speaking competition, a partnership between the university’s School of Business Administration, Patterson School of Accountancy and Trent Lott Leadership Institute. The event kicked off on Jan. 17, celebrating its 15th year. After two days of competition, Mitchell Kulesza, an accountancy student from Dallas, was declared the overall winner. The overall winner is the student who places highest in multiple categories, and Kulesza placed fourth in the Ethical Dilemma and Marketplace Pitch categories. Students competed in two rounds in three different categories: Ethical Dilemmas, Marketplace Pitch and Team Pitch. In the Ethical Dilemmas category, Emily Harral, a Master of Business Administration student from Jonesboro, Arkansas, took first place. She was followed by Jack Sutton, an accountancy student from Sikeston, Missouri, in second, and Rachel Lochridge, an MBA student from Spring Hill, Tennessee, in third. In this category, participants presented their best solutions for workplace challenges, where issues of gender discrimination, bribery, gifts for influence, altering budgets for personal gain, padding expense reports and defining the term “the right thing” were presented. Harral’s dilemma addressed an expired work visa of a highly productive employee to find a solution for the issue from the perspective of a human resource manager. In the Marketplace Pitch category, Amy Goodin, an MBA student from Booneville, took first place, followed by Jack Thompson, an MBA student from Nashville, and Maranda Armstrong, an MBA student from Collierville, Tennessee. These presentations were persuasive arguments regarding technology, strategy, leadership, productivity and innovation. Goodin’s pitch advocated for the inclusion of mental health insurance in employee benefit packages. The competition provides an exceptional vehicle for students to enhance their verbal communication skills, said Mark Wilder, UM accountancy dean. In the Team Pitch category, participating students randomly selected companies and applied a strengths, weaknesses, opportunities and threats, or SWOT, analysis to evaluate them. The team’s goal was to determine and address points of vulnerability or opportunity identified in the analysis and how best to present a solution or highlight a strength. Technology, lodging, social media, luxury goods, food services and entertainment were represented in this division of the competition. The winning team’s pitch was a remake of the film “Breakfast at Tiffany’s” to attract millennials to shop at the famed jewelry and luxury-brand company. The team, composed of Daniel Goodspeed, an MBA student from Madison; Brandon McLarty, MBA, of Olive Branch; Caroline Hill, accountancy major, of Houston, Texas; Brad Booth II, accountancy, of Bassfield; and Alan DeSantis, accountancy, of Laurel, received the Tiffany assignment through a random drawing. “After we drew Tiffany & Co., we came up with a remake of the film,” McLarty said. “Immediately, everyone was on board and we just ran with the idea. The competition helps students gain an advantage as they prepare to launch their careers, said Walter Davis, MBA program faculty adviser. “Through this experience, students develop the communication skills that are vital to success in professional and leadership roles,” Davis said. The competition was launched in 2004 by Ole Miss alumni. The event brings together industry professionals, retirees, working alumni and students, requiring students to adapt their message to different audiences. In preparation, participants spent a week-and-a-half working with volunteer communication coaches to discover the strengths and weaknesses of their own personal presentation styles in front of multiple judges.